in Sumpter. 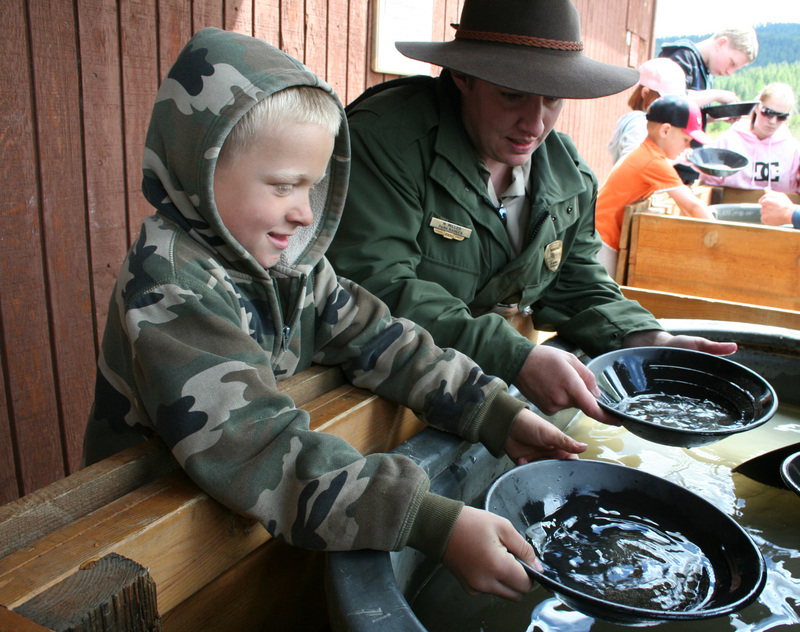 We love everything about Sumpter from the huge flea market to the gold panning down by the old gold dredge. We had a great day and even found some gold. This was the park ranger lady showing Gabe how to pan for gold. She was a tad bit grumpy but Gabe didn't notice. Gently swirrling and dipping the pan down in the water allows the lighter stuff to float to the top and out of the pan. The gold is the heaviest and tends to stay near the bottom. The whole experience was fun and took me back to the days when we used to camp in Sumpter when I was little. Dave and I joined in and we all brought home a little baggy of gold, Iron Pyrite, and garnets. Oh, how fun! Great pictures Tammy!